I am an American Artist working in the mediums of paint, printmaking, mixed media and found objects. I was born in Portsmouth Va., grew up in West Hollywood CA. and have lived in Malibu, CA since 1975. My first serious studies in the fine arts were at the Chouinard Art Institute in Los Angeles in the early 1960’s. I studied privately with abstract painter Keith Finch in Venice CA. in the late 1960’s. I also studied privately with contemporary Native American painter Fritz Scholder in the late 1980’s. I was a member of the LA Art Co-Op where I participated in exhibitions, curating and branding in the mid 1990’s. 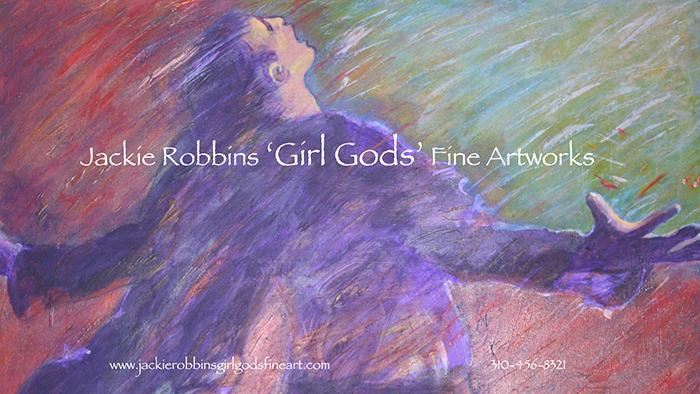 I am organizing my portfolio for the first time online under the moniker Jackie Robbins ‘Girl Gods’ Fine Artworks in 2018 for the purpose of building an audience to show and sell my artworks, as well as sharing my work on various social media platforms. I have many portfolios of different groups of my work from different periods starting in 1970’s moving forward. Each group of work represents different explorations in medium, subject, and style. Artist Statements on these individual groups are available upon request. Please contact me to learn more about certain pieces or entire groupings, such as mediums, sizes, and pricing for your private collection, Gallery or Museum project. I am interested in showing work from my portfolio and creating new work for a specific purpose, installations or private collections. …let’s talk!